Toys and stuff for kids big or small! When you’re looking for the best skateboards for beginners, you can wing it with a cheap board online, or take an extra 15 minutes to see what really matters. Our skateboard reviews cut out the fluff and give the facts. The purpose of this article is to tell you everything you will ever need to know. Whether you want to know what deck, which wheels, or what kind of trucks to get, this article will talk you through your options. I’ve taken a look at 10 of the best boards on the market, and thrown in a handy beginner’s guide. That way you’ll have everything you need, neatly stored in one place. Perfect if you want to spend your money on a board that will make learning nice and smooth. Before the reviews, want to watch an explainer video? Here’s a list breakdown of our current favourites! 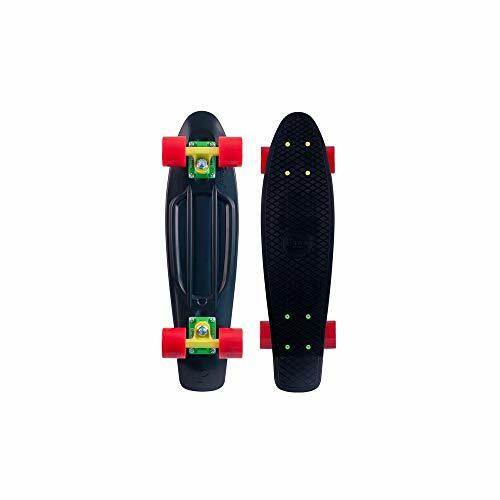 1: THE AWESOME ENKEEO PENNY BOARD! 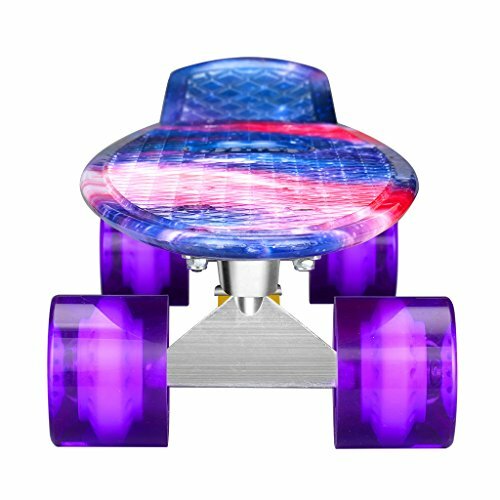 Capture the spirit of fun with the Enkeeo Penny Skateboard! The thing with skating is that you need to be confident before you can get going, and that’s where this Enkeeo comes in, as it’s a perfect starting skateboard to let kids get used to staying upright. If you want something that will allow you to keep plenty of money spare for a more advanced board later on, then this would make an outstanding choice. If you want your child to be proud of their board, something he/she can show to friends, this could be it. The cosmic colour scheme is sure to catch the eye, which is perfect if it leads to more exercise. You have the choice of four schemes, plain black, Ocean, Galaxy, and Joker. However, as should be suggested for every board, please be sure to read the safety gear section below! The kicktail is a nice addition, and not just because it looks cool. If you want your child to grow up with a well rounded skating skillset, then this is a great choice to start with. They’ll be able to try manuals which will further improve their balance. It will also keep them entertained so, they are motivated to move onto a more trick-based board later on. Perfect if you want them to get the most out of their new hobby. 2: TELL ALL YOUR FRIENDS, I AM THE KNIGHT! Regardless of the ability of the child who will use this product, the Batman Children’s beginner Board is a good option to consider for many reasons. The thing about it is that it comes with a set of trucks that allow your son or daughter to get to grips with skating SAFELY in no time at all. The look of a Batman design is a superb, as it will make your child stand out on the street. If that is what you want it to do, then this will make a great first board. It also has double kick tails at either end of the board if they’re going to learn to ollie which is excellent for his or her all-around skills. The great thing about multi-layered plywood is that it provides plenty of pop. That is what will ensure the board serves a user well when graduating to more advanced tricks. A hollow deck is a guaranteed way to stay fixed to the ground, and if your child is skating, the chances are that’s the last thing you want to happen. The wheels won’t necessarily win awards, but they do allow the user to get used to skating and have fun while doing so. The wheels will wear a little faster than urethane wheels, so be prepared for that. That said if you want to get up to speed affordably, and then move to something pricier, they’re more than worth a second look. 3: PREMIUM BUILD QUALITY – A SUPERB ENTREE! A fantastic thing about this penny is that it allows anyone to get accustomed to rolling around on the tarmac. The bearings are smooth, and the trucks rigid enough to ensure that you or your child can get to grips with it in no time at all. Perfect if you/they have aspirations of being the next Bob Burnquist. Hardwearing 78A is one of the hardest wearing materials on the market right now. That means you will get many hours of use out of the board before having to replace the wheels. However, by the time that happens, you will be ready for a standard size skateboard if that’s what aspire toward! If you want to be able to give a little one something he/she can share, then this is a great choice. As penny boards go, the 22-inch deck is just what you need if you want to leave a little bit of growing space. This also means if your little brother/sister also wants to, he can have a go to see if he likes skating. 4: I’M HERE TO WIN! Wanna be the next Shaun White ? Shaun White might hold nearly every boarding record going, but that doesn’t mean he’s going to stop there. With a new range of skateboards flying off the shelves, it was a no-brainer to add at least one of them to the list. Fancy a Funky Green version? It’s here on Amazon if you prefer this one over the White one. For the adults among you, it won’t have escaped your attention that this is the first entry on my list that you can use! It’s a durable board that is endorsed by one of the biggest names the sport has ever seen. This means that you can sleep easy knowing that the bearings won’t corrode, and the graphics won’t get scratched off too easily. The great thing about the trucks is that they’re the ideal balance of rigid and lightweight. This means that they’ll absorb plenty of the impact when you start catching some air. But they’ll also make it nice and easy for you to get off the ground in the first place. Ideal if you want the same riding experience as the man himself. If you always have half an eye on looking good, then this has to be worth a closer look. The branding is as good as it gets, and while the sharp graphics may not be for everyone, they could very well be for you. 5: HIGH QUALITY SKATING LONG BOARD! 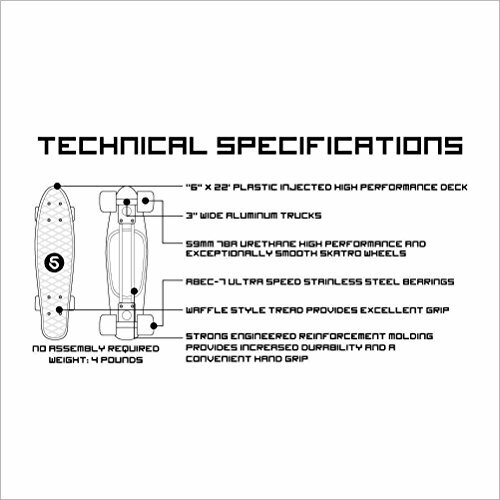 A well made skateboard with quality bearings – available in different sizes and colours as well! Cruising on, a board is excellent fun, especially if you love the sun on your back. If you want to find a new way to view the world when riding, then look no further. By rolling down to the beach with one of these under your feet, you’ll get the same sense of freedom as if you were out on the water. The thing you may like about this board is it looks fantastic when you prop it up at home. If you want something that looks presentable whether you’re on it or not, then this may well be your next board. Give it a little bit of thought, and you’re bound to think of clever ways to display it, making it your pride and joy. One thing which stands out on this board is that the ride is so quiet and smooth that it does have to be experienced to be believed. That is no exaggeration; you will hear the wheels gliding over the tarmac. Ideal if you love the smooth easy going feeling of a summer day riding. Not only that but because they’re cartridges, there’s virtually no chance of water getting in there and ruining your ride. Drop forged trucks and smooth sealed bearings make this an exquisite ride! If you want a board that rides as good as it looks, and are a risk taker at heart with no fear of scratching up your skateboard, then this durable and reliable board is most definitely worth more than just a moment of your attention. The trucks feel great beneath your feet, and that is mainly due to how they’re made. If you want a ride that feels smooth and in control at all times, then this could be just what you’re looking for. Just make sure that you start with smaller ramps the first time you take it to the skate park. That way you’ll get a much better feel for how it absorbs energy on landing. The urethane compound isn’t revealed which leaves something to be admired, but it unquestionably seems up to the job. Once you have found out what the urethane compound is, you could then certainly order additional colours if and when you fancy changing things up. The bearings come in sealed cartridges which is a nice touch. The cartridges are precision engineered so that nothing can get inside, so there’s no use for additional lubricant, which means there’s one less thing to worry about as a beginner. Now all you have to think about is where you want to skate today! The graphic will get scratched off quickly if you do a lot of tail and board slides. But that comes with the territory when you’re a skater! 7: SKATEBOARDING HAS NEVER BEEN QUITE SO MUCH FUN! Great for tight curves and Chrome bearings make it a Silky smooth ride. 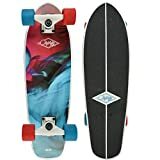 As cruising on a skateboard is something you can get into at any age no matter how old you are, this mini cruiser is an excellent option for all. 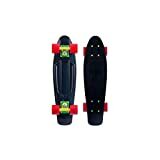 The size is ideal for giving to your young kids so that they can get a feel for cruising and carving around on a skateboard from an early age. Skating isn’t all about tricks and flips, so why not show them that. If they get the board under control, then they’ll have the solid foundation they need to go on and do more adventurous things on four wheels. The bearings are a great addition to this board, and they make it a really smooth ride. What you’re getting is a corrosion-resistant set of chrome bearings that will allow you to roll freely on virtually any tarmac or concrete surface. Ideal for a relaxing spot of cruising with the little ones. The deck comes with that famous old cruiser shape. Which may make you think that it looks like something of a throwback, but that’s precisely the point! The way it arches up is what allows you to glide down the road, and it’s something your kids will love too. All you need to do now is find an adult-sized cruiser that you can treat yourself also! How Pink can you go? THIS Pink of course! Penny boards are very popular right now and will be for a long time, perfect if you’re looking for a gift for the kids or teens. These come in a vast range of pastel colours which means there’s something for everyone. The waffle deck is a throwback to the days when Vans skate shoes would come with nothing else. If you want to pass a bit of that style onto your kids, then what better way to do it? The deck doesn’t slip, and it looks great too. It also allows for a more consistent ride over time as there’s no grip tape to rub off when you ride every day. The look of the powder coating is unique as it brings a whole host of new colours to the mix. If you’re looking for something with some unusual colours, then this could be the board for you. Just make sure you don’t try any grinding on it. Otherwise, the finish will scratch off and be gone before you know it. For a penny board to come with 59 mm wheels is quite something, so go for it, if an excellent grip is what you want? They feel great underfoot, and that’s just what you want when you’re developing your balance and trying to master something new. Check this out on Amazon here. This is a skateboard which has a similar style to a Penny. However, fortunately, it also comes with a big reputation, as this board is quite an innovative one due to its flex technology. Making this ride one which people love when they put it through its paces. You want the deck to return a lot of the energy you impart with your legs. That way you can turn faster and quicker, and weave your way around evermore tighter obstacles. Ideal for creating a great video on your phone to put on Facebook. The Flex technology on display here will allow you to do precisely that. If you’re trying to buy for someone who has a unique taste, then this is a great option. Every board comes in a monochrome finish which is ideal for adorning with stickers. All you need to do then is find the right colour for your friend, and then you’re all sorted. Just make sure you pick the right coloured wheels while you’re at it! This is really great if you want to be able to fine-tune your setup with minimal fuss. Ideal if you’re going to be able to learn about your board without having to take it around your friend’s house. 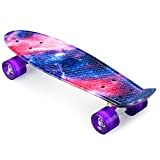 View this skateboard on Amazon here. 10: GO ONE BETTER, AND TAKE THE ELECTRIC ROUTE! Wanna get smart? Try out this fantastic electric skateboard! Electric skateboards are still something of a novelty. However, they’re proving to be somewhat popular these days, as the freedom to roam comes with the learning hassle. Gone are the days practising on a traditional skateboard, if boarding on automatic appeals to you continue reading. If you want to be able to try something new, then an electric skateboard could be just what you’re looking for. The great thing about this model is that the motor is nice and quiet. This means you still get that relaxing feeling of an old-style cruiser, but you don’t have to work hard to get up some speed. 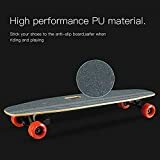 The red wheels on this board are so elegant that they certainly deserve their own subsection. It’s no use putting a motor on a board and hoping people like the rest of it, and that’s not what the designers have done. The classic red wheels make it stand out for all the right reasons, and are a feature I really like. If you want to hit high speeds when you’re going downhill, then this is the board for you. The great thing about it being electric is that you can also go uphill and on the flat without tiring out your legs anywhere near as much. Ideal if you want to zip round to your friend’s house! Now that I have explained what I think the best skateboards for beginners are, it is time to move on. Below I have provided some useful tips; please read before getting on a board or allowing your child too. Furthermore, there is detailed information about safety, as in what equipment will protect from injury. Plus, answers to some common skateboarding questions. Staying safe is the most important thing in skating, as so much of what you do will be on concrete and tarmac. Of course, when you watch the X Games, you see the pros landing some fantastic tricks, but they’re also wearing helmets, kneepads, and elbow guards. If you’ve ever heard an interview about how many bones Tony Hawk has broken, just imagine how many more it would have been if he wasn’t properly equipped. Stay safe, and you’ll be able to keep on skating. It really is as simple as that. Don’t give in to peer pressure and leave your helmet on the sidelines. Keep it on, and you’ll be much better off for it. The great thing about skating is that you can get outside and enjoy yourself, and hang out with your friends while doing so. Finding a few friends to skate with is an excellent way of making sure you stick to your new hobby. If you’re all of similar ability, then you’ll be able to learn plenty from each other as you perfect some tricks. Manuals, carving, ollies; they’re the basics, but they can take some time to master. If you’ve only just started to get some air off the ground, then why would you try to do a hard side heelflip? It might sound like a good idea, but you’ll just get annoyed with yourself as you have a long way to go. Keep practising the basics and having fun with them until you’ve really got them sorted. You’ll naturally get the urge to try a 50-50 grind, or heel flips a little later on. And because you’ve put the work into fine tune the basics, you’ll learn advanced tricks a lot faster. It’s natural to get a little bit frustrated as you try and land a new trick. The most important thing to remember, however, is that you skate to have a good time. If you find that you’re getting stressed and wound up, take a 5-minute breather. This could be in the form of a chat with your friends on the side or doing a few easier tricks. What Safety Equipment is a Must Have? Skateboarding is a tricky sport to master, and there’ll be plenty of spills and thrills along the way. Especially, when skating on concrete surfaces or wooden ramps, there’ll be zero give when you come off. It’s for this reason that it’s vital to invest in high-quality protection before you even set foot on your board. That is something to think about if you’re a parent buying a skateboard or a teenager. Did you know? On average around half of all skateboarding injuries involve children under age 15. If you want to combine safety with style, then a classic bowl style helmet like the ones by Punisher or Triple Eight is the way to go. They come with an adjustable chin strap and plenty of air vents to keep you safe and comfortable. You can also add your personal stamp on things by adorning your helmet with plenty of stickers. Ideal if you want to standout down at the skate park. When looking for wrist guards, it is essential that you find something which is of high performance, quality and a comfortable piece of protective skate gear. There is an array of products that you can buy for this. 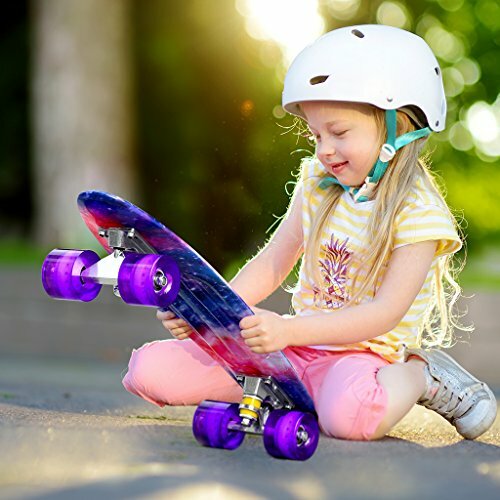 A lot of skateboarding injuries occur when a child loses control of their balance, then falls off the skateboard and lands on their arm or head. However, most skateboarding injuries involve the wrist so guards are worth considering for yourself or your child. If you want yours or your child’s knees safe when skateboarding. Then your best option is to go for knee pads that come with ultra-soft EVA padded material and robust polypropylene plastic as it does a great job maintaining its shape after impact. Also looking for padded Velcro straps which can be adjusted so it feels comfortable for the user, whether that be for you or a child. When it comes to elbow pads, the criteria are exactly the same as for knee pads, because they do similar jobs. That means that both would ideally have EVA padded material, robust polypropylene plastic, as well as padded Velcro straps. To get skateboarding protection quickly, and at a low cost, it is worth looking into purchasing a triple set of Knee Pads, Elbow Pads and Wrist Guards. You should look out for a product which is the right size for whoever you are going to be buying the product for, whether that is you, an adult or a child. This very much depends on your age. If you’re an adult, then obviously you’ll want to go for an adult board. There is minimal variation in the size of the deck depending on your height, so you can effortlessly shop for a standard size adult board. If on the other hand, you’re buying for your child, you’ll need to consider their height as this will determine the length of the board. The simplest way to do this is to look into junior sized boards and refer to size charts for the specific brand you want to buy. That way you’ll be able to get the best fit, and you won’t end up with a board which is too large. Is it easier to ride a skateboard or a longboard? In general, it’s considerably easier to learn to ride a longboard if you have a large flat area. The turning circle will be larger due to the larger wheelbase. They are however much better if you want to practice carving. There are some tricks you can learn on them, but they are far less flamboyant and advanced than on a standard skateboard. Skateboards can be harder to mount because of the raised ends. The shorter wheelbase means turning circles are much tighter so you might want to tighten your trucks to lengthen this when you start. Doing so will ensure you don’t turn too abruptly and lose balance. When weighing up the price of a board, bear in mind the other accessories that you will need to buy. A truck tool, helmet, elbow and knee pads, and some additional grip tape would all be wise additions. Factor these into your budgeting so that you have plenty of leftover when it comes to keeping yourself safe. It might be tempting to cut corners so that you can get a more expensive board, but you’ll regret it sooner rather than later. 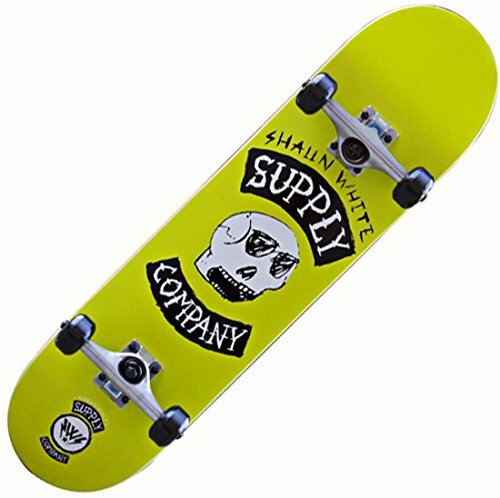 What is a good skateboard brand? There are many great brands out there, and the choice is really up to you. If you want something that comes endorsed by skating royalty, then look no further than Birdhouse. Ridden for years by Tony Hawk himself, you know what you’re getting with these kinds of boards, but really as I said above, the choice is yours. What you might want to think about, is what you’re going to use your board for. Do you like street, park, or vert? Once you know that, you’ll be able to see what the pros in each discipline use, and then choose your new board accordingly. The above is an excellent way of getting a feel for how different brands products will perform when you try them. In general, any board will work well when you’re a beginner. Of course, if you want to do tricks, then get a standard skateboard rather than a mini board or a longboard. They’re good too, but as a beginner, you might not realise just how different they perform until you start trying to learn with one of them. When you’re buying for your child, you need to be able to measure them up accordingly. Do not buy an adult-sized board for your child as it will be too heavy to get any air off the ground, and your little one won’t have enough weight to turn them properly. The most important thing to do is measure your child so that you know how tall they are. Once you know that, you’ll be able to see how they fit on the sliding scale, and you’ll be able to find the right sized board for them. There are a few specifics that you will want to put some thought into. First of all, you have the bushings on the trucks. Slack trucks are great if you’ve mastered your balance and want to carve fast. But for a beginner, and especially a child, they’re a sure-fire to fall off far more often than you otherwise would. Go for stiffer bushings that you would if you were skating yourself. That way you’ll be able to have plenty of control over the larger turning circle. This will allow them to stay in a straight line a lot easier as they get used to honing their balance. If you invest in a truck tool at the same time, then you can always slacken things off later on. This will allow you to get a bit more use out of the board before they grow out of it. Next, the difference in wheel sizes is a matter of millimetres. The smaller the wheels, the more likely a rogue pebble, or a crack in the pavement, will be to throw them off. I would suggest going for adult sized wheels wherever possible. This will provide more stability due to the larger contact area, resulting in fewer falls. You will also see far fewer scrapes and bumps that occur from the wheels getting caught in cracked concrete. The recommended size will depend on your child’s height and will vary somewhat between manufacturers. Take the time to check the relevant size charts, and then measure up accordingly. That way you’ll have something that fits them straight out of the box, and won’t stop them from practising. Penny boards are really built for going in a straight line and doing the odd bit of gentle carving on a level surface. One thing that is often the case is that budget models will often come with plastic or resin trucks. That may sound like a safe corner to cut, but always opt for metal when you can. That way you’ll have the peace of mind that comes from knowing the trucks will still be growing strong when the deck is too small. You’ll struggle to find a penny board with adult sized wheels, so you’ll need to put some thought into where they use it. Ideally, you want smooth tarmac that’s free of debris. That way there’ll be minimal risk of tears caused by a bump and a scrape. 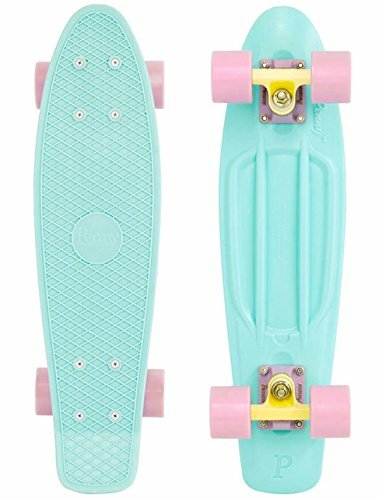 Penny boards are a good budget alternative to a skateboard, and they can come in a whole host of fresh colours. What you need to be aware of, however, is that they may not come in quite as many sizes as you would expect. 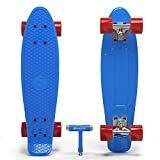 If you’re struggling to find a penny board large enough for your child, then it might be worth upgrading to a cruiser or a standard skateboard. You began reading this article because you had a simple question in mind: ‘What are the best skateboards for beginners?’ Hopefully, you’ve found your own answers in this article, along with more useful information about how to stay safe. When you’re looking into beginner’s boards, you need to have a budget in mind. There’s no reason to opt for something top of the line because as a beginner you won’t fully appreciate how well it performs. Choose something reliable, with adjustable trucks, and hardwearing wheels. That way you’ll be able to skate safely in the knowledge that your board will keep working fine until you’re ready to swap it out. If you want a smooth, rattle-free ride, then you’ll also want sealed cartridge bearings. This should prevent corrosion and allow you to get a few more sessions out of your favourite new board. Ideal if you’re going to be able to perfect that new combo of tricks you’ve been working on. Not all boys and girls want to spend their time in front of a TV, or computer screen. No, some of them dream of the rush of the wind through their hair or the excitement that flipping an Ollie, Nollie, or Hardflip brings! What am I talking about? Yes, it could be skateboarding, but in this case, it’s fingerboards. Those no-nonsense, and child-friendly indoor skateboards that your son or daughter controls with their finger. Pssst… if you are in a rush, here are our best rated finger boards. The Tech Deck fingerboards are solid contenders! Our top favourite fingerboards etc. Now that Skateboarding is mainstream, kids all over the world are following the likes of Lacey Baker, and Nyjah Huston. It’s likely they want to replicate the champions with his/her own set, so, if you’re in the position where your child is asking for these toys. I am going to show you the best fingerboards, plus ramps and bikes, that will not cost a fortune. Meaning, that not only will your son/daughter be able to play with friends. But they will also have a fun activity to keep them occupied indoors. However, be warned that delving into the world of fingerboards is a tricky one. As to become good at manipulating a toy/miniature skateboard in the air, and over obstacle accessories takes skill. So, expect your child to experience a steep learning curve, followed by wanting to expand his/her collection. 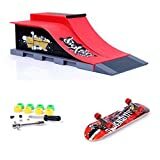 As a parent, or someone who is interested in taking learning about mini finger skateboards, you should know that the choice is vast. So, as far as my advice is concerned, I am going to show you enough to get started. Plus introduce you to a few brands popular with players, such as Tech Deck, Southboards,, and others. Additionally, you will find that the number of accessories available is wide. With the likes of big ramps for halfpipes, miniature skate parks, finger scooters, and bikes, plus more. So, now that were clear on what to expect, let’s take a look at, what is on offer. Are you looking for cheap fingerboards? Look no further. 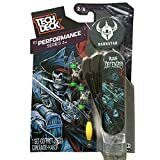 For many a fingerboarder, these Tech Deck fingerboards (available on Amazon) are at the pinnacle of miniature skateboarding. Why? Because they are one of the original brands from way back in the 1990’s, and they carry official real-world imagery. For what you get they are good value and worth every penny! Now, where this particular board is concerned, you will be sent a random one, of Amazon’s choice. Yes, it will be Tech Deck, and be approximately 96mm in length, but it could be from one of the following series. They are, FUNdamentals, DC Comics Two-Face, sticker series 2, Skate Co, Fun Shape series, or the Performance series. Looking to get started without spending too much money? 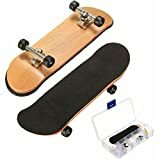 The Pizzies professional mini skateboard (available on Amazon) is made from high-quality materials such as 5ply Maple wood, meaning its durable. Additionally, the inclusion of closed bearing wheels makes it suffer from the ravages of friction, less. So, you or your son/daughter can enjoy many happy times flipping and doing tricks. Like many modern extreme sports toys, for the most part, fingerboards need self-assembly, and this board is no exception. In the box, you will find everything you need to get this cheapest of cheap fingerboards on the ramp. That includes the board itself, four wheels, two axles, eight screws, four nuts, and a none slip mat for the rider surface. Now, if you’re looking to pay a bit more because quality and brand are important, take a look at this Zebra fingerboard over on Amazon. Made by the well-known manufacturer Southboards, this is where prices begin to rise a little. However, what you get for your money is a handcrafted fingerboard made from Canadian Maple wood. In fact, this board was 100% handmade, hand polished, and coated with multiple layers of quality varnish. As a result, the deck looks gorgeous and has a deep concave and high kicks. Furthermore, it doesn’t matter if you’re a beginner, been into fingerboards for a while, or a pro, it works for all! And what makes this mini skateboard even better is that for the quality it should cost three times the price. Instead, you get a quality product that comes with everything you need to get started. What’s in the box? That’s the deck, two axles (trucks) plus silicone bushings, four wheels, grip tape, plus a tool to put it together. No, this is not a bias towards the German made Southboards; instead, it’s a tribute to just how good their handmade fingerboards are. As for this one, the freshwater version, again, it has been 100% made by hand and coated with a superior varnish. Made from genuine Canadian Maple wood, and drilled to allow multiple base plates, even those from Tech Deck, it’s quality. As for the colour, after a treatment of clear varnish, colour lacquer is applied to give it, its unique finish. Again, as before this southboards, finger skateboard is fit for the starter, intermediate, or pro trickster. In the box, you will find the deck, four wheels, nuts, axels and screws, none stick mats for placing on the deck. Plus the tools to put this board together and enjoy a low-cost finger boarding experience. If you’ve managed to pick a deck from those above, how about something different? Next up, I’ve got a great starter fingerboard ramp to show you; however, it’s also good for bikes, and finger scooters. 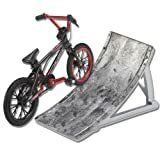 Meaning that this versatile little ramp, allows you to practice tricks with all your finger-based extreme sports toys. Manufactured using strong PVC, with the added benefit of two metal sliders, it’s perfect for the HALFPIPE. Furthermore, there’s the surprise of a deck with this kit. It’s a customisable piece of kit, that can be used as an all-in-1 starter or an addition to what you have. 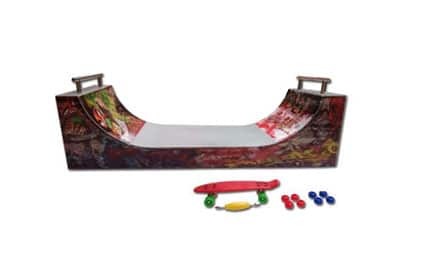 Additionally, this ramp comes ready made in the box, so should you already own a fingerboard, bike, or scooter, it’s ready to go! As for the deck, it will need some assembly; however, the tools to do that are included. If you are getting bored with the Halfpipe ramp, why not mix things up a little with a skate park kit? 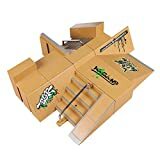 This one (on Amazon) by Creation comes with 8-pieces meaning that there’s a lot of tricks to be done on this miniature park. Made from strong and durable plastic this kit will keep you, your son, or daughter challenged for hours at a time, why? Because it’s ultimately configurable into any shape you wish, meaning the number of trick combinations possible is endless. With this kit, you will get the eight configurable pieces, plus the tools for assembly. Additionally, there are stickers to personalise the ramps and other parts, and three fingerboards to test your construction. It may be difficult to see why when you’re new to fingerboards, but some players like to show off their collection. Imagine, you’re the best at Kickflips, Ollie’s, Bigspin’s, Gingersnap’s and more, but proud of it. Wouldn’t you want to show the world the boards you use? Of course, you would, and that’s why Tech Deck have put together this Skate Shop bonus pack. It’s perfect for a pro fingerboarder who needs something or somewhere to put his/her pride and joys. This pack includes everything you need, to customise and show off your skateboards. It comes with three 96mm fingerboards, and three spare decks, plus the most famous licenses to display on them. Of course, there’s also a display rack, something that you can hang your boards and associated accessories on. If you’re one of those people, who jump into something new head first! Why not get yourself a complete Finger Board, Bike, and Scooter setup? It comes with not only the means to get around but also one of the better fingerboard ramps I’ve seen. Similar to the lone ramp I talked about earlier, it’s made of strong PVC, and has metal sliders. However, this one is adorned with some great artwork to make it look authentic. 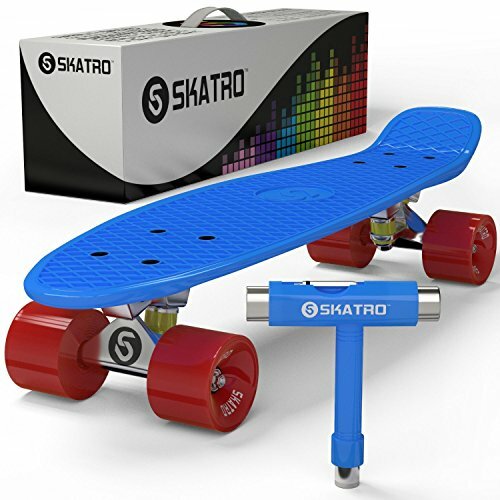 Additionally, there’s a rack to keep your boards safe, and what looks like a pair of roller skates, perfect for backwards speed skating. For the most part this set comes pre-assembled; however, as is common with fingerboards there are tools included for assembly. Oh, and best not forget, there are also two spare wheels for the finger bike. Ok, fingerboards, are not your cup of tea, but what about finger bikes? There are many tricks and stunts worth learning if you have two fingers, a ramp and a stunt bike. And that’s exactly what you get in this Flix Trix set. Plus, if you’re feeling brave, you could also try out a trick or two with your scooter or board on this ramp. Yes, it wasn’t designed for them, but, never say, never! This kit (available on Amazon) comes partially assembled, the ramp is ready to use, but the bike will need its handlebars attaching. The tools to do just that are included within the packaging. Last but not least, I have a pack of finger scooters to show you, this one contains three. Known as, finger whips, scooters enjoy a large following in the world of extreme finger sports. As such, no setup would be worth its salt without at least one. In fact, the number of ticks you can do with one is about as limited as is your imagination. So, this pack is perfect if you feel like a bit of trial and error extreme sports. The scooters themselves, come packed with neat features, such as fully rotating handlebars, die-cast metal frame. Plus interchangeable parts enabling you to customise each one before setting out to amaze your friends. Inside the pack, you will find the three scooters, and stickers for each, you choose which goes where. These stickers are a selection of quality real-world art which helps with authenticity. Also in the pack, are a pair of spare wheels, stands for each whip/scooter, and a tool for assembly. And there you have them, the top 10 best fingerboards, bikes, scooters, ramps, and accessories. They are the products I recommend you take a look at if you are starting out, or if you’re already a seasoned pro. All of the above, are quality products, you, your son, and daughter would be proud to own and show other players. However, before you go off and decide which to buy, I’m going to share some extra information with you, it will be helpful. Now, when starting off with these mini skateboards, you may hear others say get “Tech Deck boards, they’re the best”. As with everything else in life, that is a matter of opinion; however, you don’t need the best fingerboards, to begin with. No, you just need to practice, so don’t overspend, just for the sake of buying a brand name. Unfortunately, if you’re purchasing for your son or daughter this may not be an option, so look at the deals I have shown you. All of those above are currently below the RRP (recommended retail price), each offering significant savings. As for how to use a fingerboard, first, you need to learn what the standard position is. 1. Start by placing your index finger in the centre of the board and your middle finger at its rear. 2. Now that you’re in the standard position, you’re ideally placed to do the trick called a Shove It. Using your middle finger, (the one at the back of the board) flip the skateboard towards you. 3. At the same time as completing step 2, put a slight bit of pressure on the centre of the board with your index finger, this will help you keep it under control. Continue to practice until you do a 180° spin. As you can imagine, there are hundreds if not thousands of tricks that can be done. However, everyone has to start somewhere, so here’s a brief how-to do a Manual, and Nose manual. 1. With your fingers placed in the standard position, (see above) move one of your best fingerboards at a controllable pace. 2. Next, using your middle finger put some pressure on the rear of the board to bring up the front (it’s called half-popping). This should be done while the skateboard is moving, do not stop! That’s it; you have now completed a Manual. The Nose Manual: To complete this trick, you just have to half-pop the board from the front, and your done. It’s the direct opposite of The Manual. What other Beginner Tricks are there? As a beginner, you will probably feel daunted, that’s normal, but don’t let that put you off. No, practice, practice, practice, and you will soon have the above tricks down perfect. After that, you’re probably going to want to mix your best fingerboards with some more complicated tricks. When that happens, you have many different types of methods to choose from. Many of the most common use two fingers, as you discovered above, some use a flat surface, others ramps and rails. However, here are a few that you should search out, each is aimed at you the beginner. Now that you’ve become fully immersed in the world of the best fingerboards, you’re probably wondering where they came from? The answer to that is, Keychains, that is, after the likes of Jaken Felts, who in the mid-1980’s wrote about how to make one. However, it wasn’t until the 1990’s that first, the keychain, and then toy makers started manufacturing them. Now, many decades on, their popularity continues to grow, with both sexes partaking in a bit of miniature skateboarding. If you were to search Google right now, you would find news of multiple competitions being held in many countries like Germany. In fact, in places like the U.S.A, players who are good enough can gain sponsorship from one of the big manufacturers. However, this does require the player to have a following on the likes of YouTube, Twitter, and Facebook.